App developer Jared Cocken tells PSFK how Inscape uses sophisticated data technology to build a better mindfulness experience and help users form a meditation habit. Inscape is a meditation community and retail platform with both a brick-and-mortar space as well as a robust digital offering via smartphone app. 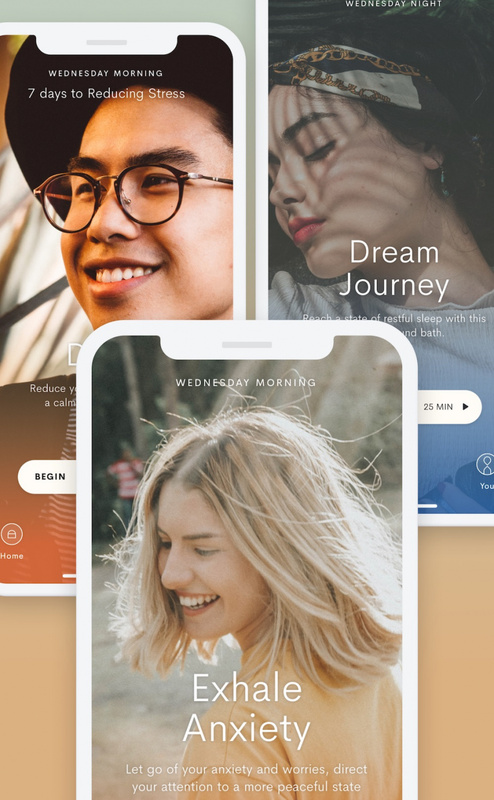 Marshaling user data and machine learning, the app is able to deliver curated content for every individual, using technology to create a more meaningful mindfulness experience. Previously, PSFK spoke to Inscape founder Khajak Keledjian about his professional evolution from founder and CEO of Intermix to meditation enthusiast helping to bring mindfulness to the masses. Here is the second part of PSFK’s Inscape coverage, this time in conversation with its app designer, Jared Cocken. PSFK: Could you tell us a bit about the Inscape app experience? Jared Cocken: We recently updated to Version 3. A few things went into the redesign for it. The main issue that prevents people from building any kind of healthy habit, whether that’s going to the gym or brushing their teeth or meditating, is all of the other stuff that’s happening in their life. One of the things that’s undervalued in design in general is simplicity. If you look at something like Uber, they didn’t actually invent the concept of you booking a car—they just made it much easier. The default view was the map of where you were. All you had to do was hit the button, and the car would come and get you. Your credit card was already taken care of. They made that habit much easier to use. The same thing goes for us. One of the things that we’ve done with Version 3 is machine learning. There’s an AI system behind the content now. When you open up the app, it’s a one‑screen interface. Once you go through with the onboarding and you’ve said, “I need help with sleep,” or “I need help with stress,” or “I need help with relationships,” we use that as the first cue for what content we should show you. Then, based on what you actually listen to in the app, and what other people like you listen to in the app, we make the next recommendation. We’re constantly in the background. The system looks at the content that someone is most likely to complete, based on the last thing that they completed, based on the time of day. That home screen also changes based on time of day. If you come in in the morning, you might be more likely to see content around commuting, for example, or an energy meditation to get you going. In the afternoon, it might be something again to raise your energy a little bit. In the evening, it’s probably more likely that you would see something to calm you down. As you swipe through these, we give you these three recommendations at any time of day to give you enough choice to make a decision— but not too much choice. We’re also avoiding the problem of Netflix, which is, “I spend more time looking for a show to watch than actually watching the show.” We need to get you into the content as quickly as possible. If for some reason you don’t like one of the recommendations that we show you, we also learn that and you’ll then look inside explore menu. The other thing we’re seeing is, people don’t come to us and say they want to learn meditation. What they want is a solution to a problem they have. If someone is not sleeping, they’re looking for a solution for sleep; if they’re stressed, they’re looking for a solution for stress. Same thing for relationships, with problems at work. Meditation is just the tool that we’re using to help them with that particular problem. We also have at the top these daily playlists, a mix of things that is permanent. A permanent playlist might be breathers under five minutes or energy meditations under five minutes. Then you’ll have ephemeral playlist as well, which could inspired by things like what’s happening with the stock market. When something like that happens we create a bundle of content specific to that day. It could be Valentines Day, it could be Christmas, Hanukkah. We can be a little more fun with those things. They can be specific to times of the week as well. For people who don’t like Mondays, you can have a playlist on a Sunday night. We can create content around dating issues on specific days of the week where people use dating apps more. Once we’ve proven that the painkiller content works. Then we can get them into the vitamin. We can get you to sleep, that’s the first problem. The second problem is how do we help you deal with the anxiety or the stress or the challenges that are actually causing that sleeplessness? That’s the one, two‑step system we’re using now. From a sharing standpoint, we noticed that a lot of people were going onto Instagram Stories and posting a screenshot of whatever meditation that they completed, and tagging us in it. We added this fun little feature for basically taking a selfie and assigning a template to it, then sharing that to Instagram Stories, which people are doing and is a little indication of where we might go in the future. We’re beginning to use photography of people in the app that are a representative of all the people who come in here, because it’s a community. A lot of people think traditionally of meditation as being an inward looking thing, which of course it is. But you’re doing that in order to be a better friend, to be a better colleague, to be a better spouse. It’s about how meditation can help you be basically a better citizen of the world. We’re trying to capture that community vibe and the essence of what happens upstairs inside the app, which has resonated well. Could you explain a bit about how the content is made? Typically, there’s a two‑step process. The first is that we’re constantly looking at our own analytics. If we see that something is resonating well, we’ll reach out to users and we’ll ask them why they liked a particular piece. We’ll get to the understanding—was it the music, was it the voice, was it the duration, was it the theme? What about it was successful, so we can make more of that particular thing? Then if there is something that we haven’t got in the library at the moment, we will do a lot of research in terms of what that should be. When we make a new series, that series has to do two things. It has to be the painkiller and the vitamin. We look at something like love and relationships for example. We will create a new series on love and relationships. If that series goes well, you look at what you can do next within that category. You can just give someone who has challenges in that particular topic more, but new types of content. You might go from relationships with friends to intimate relationships or relationships at work for example. We research that thoroughly, and then we write the scripts for that particular piece. We decide what the background music is, and then we go into recording, then it’s just a standard production process. Then that gets rolled out to the app or upstairs in the studio, then the analytics starts churning away in the background and we can understand when people are listening to it if there’s a particular chapter that resonates or session that resonates better with people. We also go in and tweak the content a lot. If we find that we’re getting feedback on the duration of a piece, we can change the duration, the music volume, or people don’t understand an instruction around breathing, we will actually go in and rerecord that particular part of that session to make it more clear. Could you speak about where you see the app going, its next steps? There are a couple of things that this space in general needs to do. Like I said before, one of the biggest challenges that people have is habit formation. Once someone is inside your app and they’re listening to content, they tend to form a habit around that thing. The thing that distracts them is everything else that they’re doing. We would look at ways that we can improve the habit‑forming nature of the app to encourage people to come back in. Everyone says that they’re busy, but people are busy checking Facebook, WhatsApp, Instagram, Snapchat, all of these, or watching something on Netflix. These moments that we have every day just vanish. Meditation, like the gym, is something that requires work and it’s much easier to be passive and go through your Instagram feed like everybody does it. Why would someone be more interested in meditation? How can we encourage that to happen? That’s one thing we could look at. Then there’s just the connection between all of the things that we’re doing at Inscape. It’s not just the app. We look at this holistically. For or people who come to the studio or are using the ecomm or any of the other things we’re working on, how do those things better connect together? Seems like such a wonderful tool to help build people’s habits [around meditation]. Right, and it’s not all or nothing. You might get a casual user of the studio who comes once a month but listens to the app several times a week and maybe comes in and gets a book or a candle. It’s about how we can create experiences for them. They can take the content with them, but what are the other things that they can buy or have around them that recreate a little bit of that experience? It’s very rewarding when you have people who have previously been using something else, medication for anxiety or sleep, for example, telling you that they’re not using anything anymore except meditation. That’s one of the things that we aim to do. We aim to help people in reducing that reliance if possible. If that’s not possible, then at least give them another layer of protection against the things that might be causing anxiety or lack of sleep. We’re another tool in the toolkit. Inscape is driving value by designing tools with its consumers’ unique needs in mind. For more ideas from similar inspiring retailers, see PSFK’s reports or newsletters.